Thanks so much to Kit Noble for putting together this fabulous video highlighting fabulous moments from our 2015 swim. Swim Across America : Nantucket 2015 from Kit Noble & Nantucket Films on Vimeo. 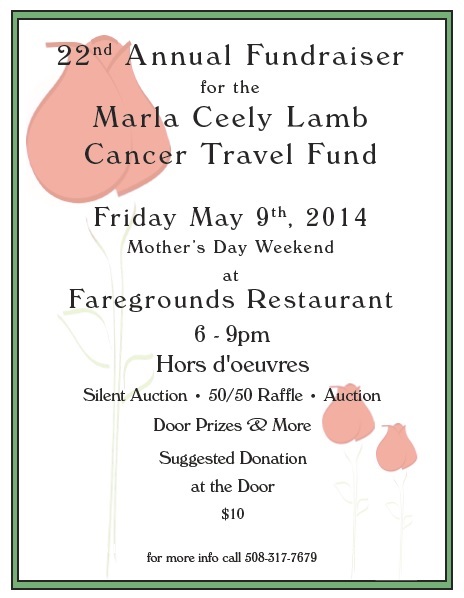 The 22nd Annual Mother’s Day Fundraiser benefiting the Marla Ceely Lamb Fund is scheduled for Friday, May 9th at Fareground’s Restaurant from 6-9 pm and will feature hors d’oeuvres, silent auctions, a 50/50 raffle, door prizes, and more. $10 suggested donation. Call (508) 317-7679 for more information. The Marla Ceely Lamb Fund is a special fund which helps defray the costs of transportation and lodging for patients who must travel off-island for cancer treatment. It is managed and administered by Palliative & Supportive Care of Nantucket (PASCON). 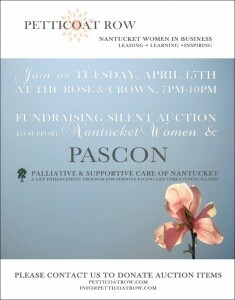 Please join members of the Petticoat Row group in support of PASCON and Nantucket women for a silent auction fundraiser on Tuesday, April 15th at the Rose & Crown from 7-10 pm. Palliative & Supportive Care of Nantucket (PASCON) is a specialized health care program dedicated to providing excellent physical, psychological, social, and spiritual care for persons with life-threatening illness and their families. It is an organization helping the family and friends of many members of the Petticoat Row group, and it is here to help anyone on Nantucket at any time. To donate to our silent auction, please contact Zofia. To help spread the word, share this post, like us on Facebook, and share the event poster. Marcoux, who was diagnosed with breast cancer last March, is extremely excited to give back in this way to PASCON, where she has attended monthly cancer support groups and received individual counseling. All four artists have been affected by cancer and feel passionately about supporting organizations such as PASCON who work tirelessly to care for those in need. Palliative & Supportive Care of Nantucket (PASCON) is a specialized health care program dedicated to providing excellent physical, psychological, social, and spiritual care for persons with life threatening illness and their families. 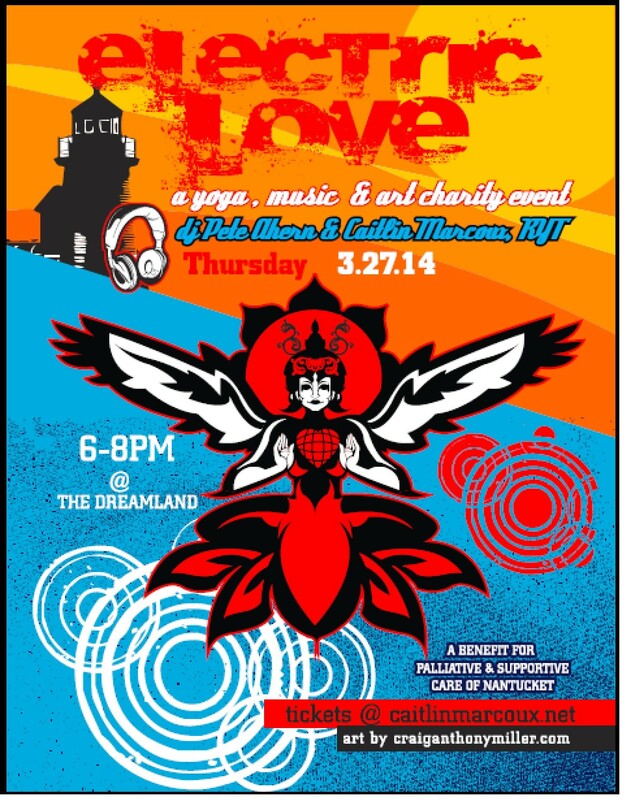 The event will be hosted by the Dreamland in their Studio Theatre and will run from 6-8pm on Thursday, March 27th, 2014. Space is limited. Advance purchase recommended. Click HERE to reserve your space. 100% of the profits will be given to PASCON. Palliative & Supportive Care of Nantucket Foundation (formerly Hospice Care of Nantucket Foundation) is a non-profit organization dedicated to supporting and funding palliative and supportive care services for the benefit of the Nantucket community and to increasing awareness and providing community education and outreach about palliative and supportive care.Through a unique collaboration with the Nantucket Cottage Hospital, the program is operated as a department of the Nantucket Cottage Hospital while all funding for the program comes from the Foundation. Learn more at www.pascon.org. community activities. Learn more at www.nantucketdreamland.org. In honor of National Hospice and Palliative Care Month, first and second grade students at the Nantucket New School were asked to think about what it means to care for other people and to create something that illustrates this important act. For one it was simply sharing a cookie. For others it was holding a hand. 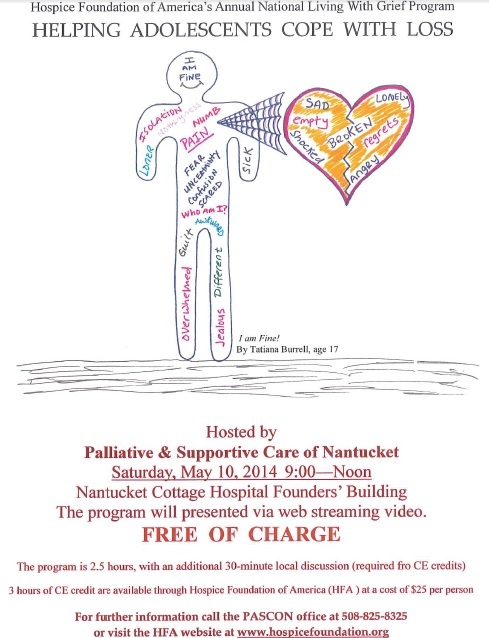 Be sure to check out all of the students’ interpretations of caring at the Nantucket Cottage Hospital during the month of November. Their masterpieces will be on display in the hallway between the main lobby and the ER. As is so often the case, looking through the eyes of a child gives us new perspective and reminds us that we don’t need to go to great lengths to care for others. We need just offer a hand…or a cookie. Jules Embry-Pelrine had run for 24 hours and over 100 miles at 7 pm on Friday! He began his course at 150 Old South Road on Thursday evening and covered most of Nantucket Island twice over the next 24 hours. Jules is quick to point out the staggering number of miles covered in the same period by world record holders. We’re quick to point out that he is our record holder and is an awe-inspiring athlete and humanitarian. Jules ran in support of the Marla Lamb Fund, a fund which helps to defray the costs of lodging and transportation for island cancer patients who must travel off-island for treatment and care. Jules raised money and awareness for this important cause and we at Palliative & Supportive Care of Nantucket are so grateful for his efforts! Island runner extraordinaire, Krav Maga instructor, and all around great guy Jules Embry-Pelrine has organized a run around Nantucket island beginning at 150 Old South Road at 7 pm on Thursday, September 19th. Jules has mapped a route that he plans to run three times over the course of the day (and night). Jules apparently never tires. In the past 3 or 4 months alone, he has competed in the Race for Open Space, the Rock Run, the Firecracker 5K, the Iron Man, and the New School Spring Dash – just to name a few! With this latest endeavor, Jules is raising money for the Marla Lamb Fund. The Marla Lamb Fund is a fund administered by Palliative & Supportive Care of Nantucket that helps to defray the costs of travel and lodging for island cancer patients who must travel off-island for cancer care and treatment. You can show your support for Jules and the Marla Lamb Fund by clicking HERE. You can also email Jules for more information. Jules welcomes walkers, bikers, and joggers of all levels and encourages people to join him for any portion of the course. Click HERE to view the course. The winds were blowing and the waves were rough at Jetties Beach early Saturday morning, but that didn’t stop nearly 200 swimmers from jumping in and “making waves to fight cancer”! Swim Across America’s Island Swim raised $180,000 for cancer care on Nantucket. Proceeds are to be split between Palliative & Supportive Care of Nantucket and Nantucket Cottage Hospital. Island patients Caitlin Marcoux and Claudia Kronenberg spoke for a few moments about what this event means to them and how the funds raised will help. Both were extremely humbled by and grateful for all of the support they’ve received. They were thrilled to have this opportunity to raise money for services that will help them and so many of their friends. Nantucket Cottage Hospital’s new oncology program will enable island cancer patients to receive more of their tests, consultations, and services on Nantucket, alleviating the need for travel off-island and all of the stress that goes along with that. Palliative & Supportive Care of Nantucket will be able to expand their existing cancer support services which help patients from diagnosis onward and which are crucial to navigating a life with cancer. Head to Jetties Beach on Nantucket tomorrow, August 24th, at 8 am for Swim Across America’s Island Swim. Watch as people of all ages and skill levels swim together in support of those they know and love with cancer. In what will hopefully become an annual event, the Nantucket community has raised over $150,000 to be used for cancer care on island! Swim Across America began as a relay swim from Nantucket to Hyannis in 1987 and has evolved to 15 open water swims and dozens of pool swims around the country. Swim Across America has raised over $45 million for cancer research, prevention, and treatment. Nantucket is thrilled to be included in SAA’s roster of events and will benefit greatly from the funds raised. Nearly all of the money raised will be split between Palliative & Supportive Care of Nantucket and Nantucket Cottage Hospital for cancer care on island.